Tappan Zee High School’s Blauvelt Lions Leos were involved in a whirlwind of community service events at the end of September! 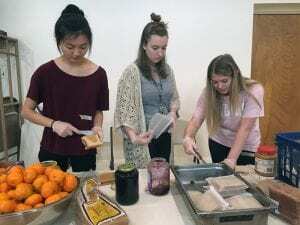 On September 24, student volunteers set tables, packed bounty bags, and prepared and served dinner to more than 60 adults and children at the Soup Angels Soup Kitchen in the First Reformed Church of Nyack. The Leos, club advisor Tricia Castelli, and Blauvelt Lions members Kathy Mart and AnnMarie Castleton support Soup Angels on Monday nights every two months. More than 40 Leos members volunteered at the St. Dominic’s Convent 68th Annual Autumn Festival in Blauvelt on September 29, while others helped out at the Leukemia and Lymphoma Society’s Red Card Cancer OMM Soccer event at the Orangetown Soccer Complex in Orangeburg, which raised over $2,100 to date. The following morning, Leos rose early for a 7:15am Breakfast Run with members of the Immaculate Conception Church in Stony Point, to deliver food, clothing and toiletries to nearly 80 homeless individuals in Manhattan. In addition to Ms. Castelli, the Leos were joined by Blauvelt Lions members Mike Conklin and Bob Simon. “The Leos had a very gratifying weekend helping others and look forward to many more opportunities in the coming months,” says Ms. Castelli. For more photos, see the district Facebook post.